As this post comes just two weeks from Christmas, I think it is appropriate to start by wishing you all a very Merry Christmas and a Happy 2019! I wish you a happy, prosperous, healthy and very happy new year with a lot of cycling activities, be them for pleasure, commute, travel or sport. Since about September I’ve been cycling regularly to work. September and October I’ve managed to cycle to work and back in average 3 times a week, but as this is the UK and the weather is not one of the best points here, that has gone down to mostly 1 time in the week, occasionally two. The distance from my door step to the office is of just under 17 Km (just over 10 miles) and it usually takes me just under an hour to get there. I then, obviously, have to cycle back in the evening, so each time I do it, it adds about 33 Km to my Garmin / Strava mileage and, best of all, lets me eat about 5 equivalent Big Mac burgers that day (not that I eat that much or that I eat McDonalds at all, but it should give you an idea – about 1,600 C calories against 300 C for a Big Mac apparently). Some friends and colleagues have asked me about the ride, so in the cold, but beautiful morning of the 4th of December I decided to mount my Sony Action Cam on my helmet and record the ride. Hope you enjoyed the video and the music. I am very grateful to everyone who I shared my life with this year and for all the love, care and learning experiences we were able to exchange. God bless you all! Just a warm embrace and a smiling face, just a place to be with enough to eat, to be free from pain sheltered from the rain , just The little things. To be given care, with enough to share, just hear you say you’re not far away. Free to walk or run watch the rising sun, It’s The little things. This is NOT an excuse… I don’t need to find excuses, I admit I have neglected EyeCycled. My justification is simply that I can’t find it in myself right now to spend the time EyeCycled demands to keep it going . I continue to cycle and the bicycle is still one of the most important things in my life. At least 3 times a week I cycle to work and back (that is 20 miles / 33 Km each day) and once a week I drive 90% of the way and cycle the remaining 10% with my newly acquired Dahon folding bike. The problem is when I get home, especially on the days I ride 10 miles back, it is so late and I am so full of having spent all day in front of a computer screen that I simply cannot find in myself to spend and entire evening editing videos and writing blog posts. As I said, this is not an excuse, but I am just living this moment of my life right now. I still have plans for EyeCycled and I do work occasionally on EyeCycled stuff. I am still working on videos from my Faith’s Way (Caminho da Fé) pilgrimage in Brazil last years and started a post on a bike ride I did in Little London (Londrina, Brazil) last year also. It is not that I completely stopped doing something. I am just doing it very slowly (very!). Today was a special day and I want to share it with you, so you know I am not lying. I rode with my youngest son and his Godfather from Twickenham to Teddington, where we met the rest of the family for brunch at a Polish Café and after that we rode to Bushy Park to see the deer and to Hampton Court Palace for a few pictures of this landmark and from the Thames. From there we rode to Kingston Upon Thames, did a little coffee / hot choc stop at the YMCA Hawker by the river and then back to where we started through the Teddington Locks. Those familiar with London will know or have heard of these places. I value your time and attention. But have you ever done a long touring trip on a bike? One that lasted several days and hundreds or perhaps even thousands of miles / kilometres? That is exactly what Martin Zlámal from the Czech Republic is doing now. He is riding his bike from the village he was living near Manchester in the UK to his family home in the Czech Republic, a trip of over 1,000 miles / 1,600 Km. 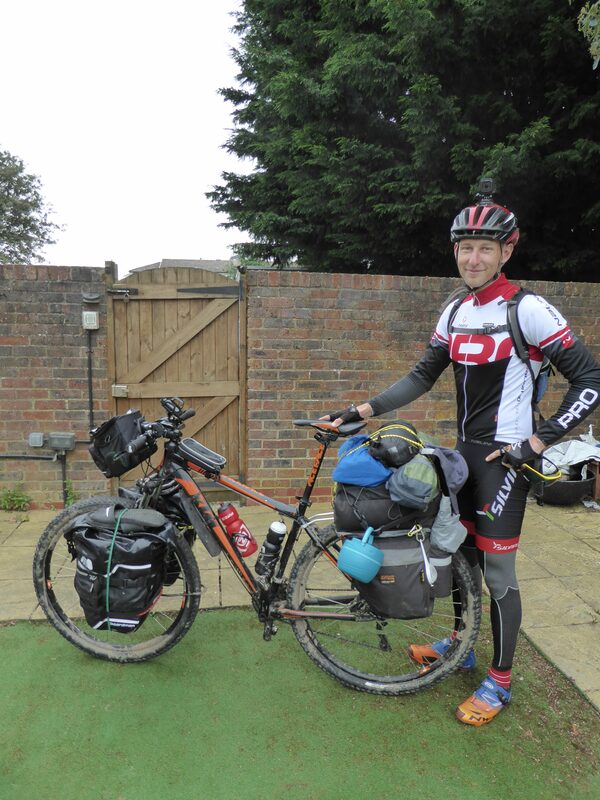 I met Martin through Warmshowers.org, a free worldwide hospitality exchange for touring cyclists. I have been a member of Warmshowers.org for 3 years and 3 months and never had any touring cyclist requested to be hosted by me. I guess I am just not in any major touring route. As a guest I was only successful using it once, as well, in Pavia, Italy during my cycling pilgrimage on the Via Francigena to Rome. I sent dozens of requests over the years, but I guess, since the platform acts just as an interface between people, its practical success depends more of the willingness of their members to actually host and be hosted than the technology itself. It is a great idea though and I wish we could learn to live and share our resources more often. Only those that have traveled long distances by bike fully understand the value of things we normally always take for granted. A nice warm shower to clean all the dirt and the sweat of a long day of cycling and a comfy bed. Of course, what each host can do for their guests vary with the resources they have available for themselves or are willing to share with them (a warm meal, laundry of the dirty clothes, etc). This is where I said Good bye to Martin, half way between Bracknell and Guildford. The day we can make this idea work every single time, will be for me the day I will become completely certain that our civilization will not only survive, but strive, because that would be the day empathy will be common place and not fear, greed or selfishness. Regardless of if you are a cyclist or not, I’d like to encourage you to become a member of Warmshowers.org and help those on the road, providing at least the basic comforts that every human being should have. 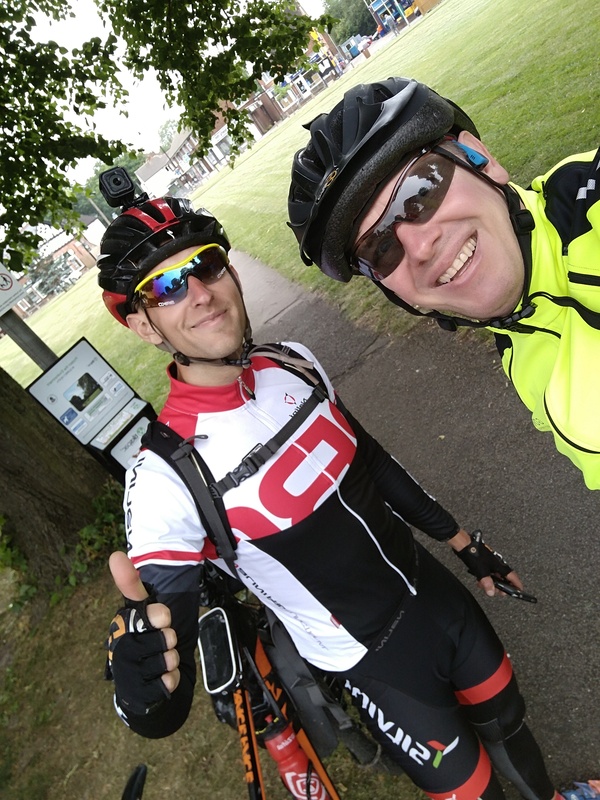 The link below opens the “Relive” video for the short ride I’ve done with Martin from Bracknell to Frimley Green which is 25 Km from Guildford, the first destination of his trip today. 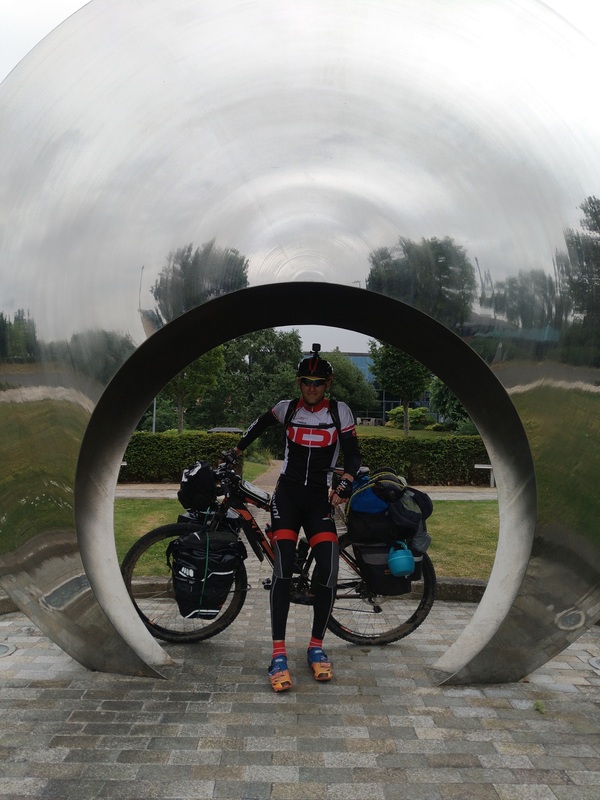 Martin plans to ride all the way down to the Ferry port of New Haven, take the ferry to Dieppe, in France, and then ride to Paris on the Avenue Verte, a disused railway line that was converted into a cycle way and leads right into Paris. The route he will then take to the Czech Republic is still open, so if you have suggestions or can help him further, please feel free to leave a comment, as I am sure he will be checking back on this. Martin, be safe and enjoy your trip mate! I haven’t posted about anything other than my cycling pilgrimages for a while and I must confess I got a bit bored of writing only about them, but if you’re looking forward to seeing more of them, don’t worry, they will continue. Of the 29 days I spent cycling from Canterbury to Rome in 2016 I’m still working on the 7th day and of the 12 days I cycled from the town of Sertãozinho to the Basilica of the National Shrine of Our Lady of Aparecida in Brazil in 2017 I am still working on the 3rd day, so I am fully aware I’ve got a lot of work to do. This week, however, I wanted to share something different with you. Few weeks ago, my friend Richard, who is the father of one of my son’s school colleagues, met me at their school and we started talking about my time in Brazil last year and my cycling in general. He said he had been wanting to take up cycling again, something he had always enjoyed, but with the burdens of modern life sometimes gets neglected. Does this sound familiar? So, we’ve been riding together once a week for a few weeks now and I truly enjoy his company. There are many things that motivate people to start cycling. For some is the feeling of freedom, being on your bike, not depending of any external engine or fuel other than strength of your legs and enjoying the wind in your face and so on. For others is the (desire or need of) physical exercise or some time to relax. No one can deny the benefits of cycling for the well being of a person, physical and mental. One other thing, however, that motivates people, me in particular, is the ability a bicycle has to reach practically any place a person on foot would and to do that faster than walking, hence cover more ground. You can travel by bike for days, cover great distances and explore fantastic places along the way. With the appropriate bike you can take that very uneven and narrow path full of gravel, stones and sand of MTB trails or ride among the pine trees of a forest, get muddy, go up or down hill and find nature at it’s best, untouched and clean, keeping it as such. But who said such places cannot be found all around you? Have you explored every inch of a radius of 20 miles / 30 Km around you? I’ve been cycling regularly in Bracknell, the town I live, since 2012 (and “unregularly” well before that). Bracknell is not a big town, but is not a village either. The Bracknell Forest area covers a region of 109.4 km², so there is plenty to explore. I’ve moved to Bracknell in 1995 and although I’ve spent a few years away, working on jobs abroad, my time in Bracknell is getting close to 16 years now, altogether. Richard has lived in Bracknell for 23 years, so together we have almost 40 years of Bracknell Forest experiences. One would expect we would know every corner of this place by now. Yet, every time we go out we find something new, some place neither one of us has ever been before. I am willing to bet, this isn’t unique to us. I bet wherever you (the person reading this post), live you will also find places nearby you’ve never been before. It’s been said that the place we least know is the place we live in. Some of us will have probably explored more while on holidays than in the places we live in. May I suggest you add a little bit of spice in your everyday life, get on your bike and go looking for places nearby you’ve never been to? That street you’ve never been to before, just a few blocks away, might have houses with an interesting design or architecture or gardens full of flowers that are visible from the road. Maybe there is a little river, stream or creek nearby with clean water and perhaps even fishes or toads in it. Or perhaps the local forests or parks have wild life you’ve never expected, or a lake or tracks that lead to wonderland. You’ll never know how deep the rabbit hole goes if you don’t take the initiative and peek inside. When I get out on my bike I normally leave home with a general idea of the direction I want to go. I try to cover the 4 cardinal directions (North, East, South and West) on a rotatory basis. On this ride I wanted to go south. My initial idea was to ride to Crowthorne and then perhaps go in the direction of Finchasmtead, but as we started our ride, Richard told me he had never heard of the Devil’s Highway. Devil’s Highway, huh? Did that spark your attention? Well, it should! The richest feature of a web page is the ability to link to other pages, so I will not go into much detail, since I’ll be leaving the links for you to jump to the information, if interested. The Devil’s Highway is actually the remnants of an old Roman road connecting Londinium (London) to Pontes (Staines) and then Calleva Atrebatum (Silchester). So, in this ride Richard got to know a bit of the history of the Devil’s Highway, but to my surprise we also found a place in Sandhurst I had never been before. I was trying to reach the gate to the Wildmoor Heath Boardwalk, as this was another place Richard didn’t know about. I had been there only once before and got a bit lost trying to find the gate. In the process of getting lost we rode through the Snaptrails park, “an attractive 3.5 hectare Green Flag awarded park located to the west of Owlsmoor in Sandhurst“, according the the official Bracknell Forest County page and I must agree. We would have never found this park if we weren’t lost and on bikes. We managed to find the Wildmoor Heath Boardwalk as well, just took a little longer and on our way back home we rewarded ourselves a pint at “The Prince”, a local pub in Crowthorne . “. Bracknell residents post all sorts of things in this group and on the 23rd of April someone posted a picture of a “tunnel” or an underpass that apparently not a lot of people knew existed, including myself. To me that is too tempting of a challenge and I made myself a mental note that on my next ride, which was 3 days later, I would try to find this tunnel. According to some comments left by the poster, he seemed to think this tunnel was build as a way to enable local farmers to move livestock (cattle, horses, etc) from one side of the A329M motorway to the other. Whether that is true or not it is hard to say, but it does certainly make sense for an otherwise forgotten structure that links no place to nothing. I looked in Google Maps and the images suggested it was possible to reach the tunnel from the fields behind the Coppid Beech Hotel. That wasn’t easy and I don’t recommend to anyone attempting to find this structure from this side. There are point of very narrow tracks covered by thorny branches from both sides, which can easily rip your skin off if you are not careful and made it impossible for us to continue on our bikes. We had to abandon the bikes and tried to find it on foot. We managed to get to just approx. 100m from the tunnel’s entrance on top of the A329M’s railway bridge, but when we looked further in that direction we both thought the path would lead to the Jennett’s Park round-about as the tunnel’s entrance wasn’t visible due to vegetation covering it. Not knowing we were so close, we gave up and tried to reach the tunnel through the small roads and lanes behind HP’s headquarters (Moor Ln). We’ve spoken to a number of people along the way and their response about the existence of this tunnel was 50/50. A couple we spoke to confirmed the tunnel existed, but that the access to it was very difficult, as we found out. Another gentleman working at a car repair shop also confirmed the tunnel, yet his mate working besides him had never heard of it. Further down the road we hit a locked gate. I asked another gentleman that was nearby and he said he had lived for 30 years in that location and had never heard of such tunnel. Well, I knew it existed because of the picture in Facebook and the challenge started to become even more tempting under such conditions. It feels like a gold race. Due to the locked gate, we gave up trying to reach the tunnel from that side and took the railway overpass behind the Dell building towards Jennett’s Park. There is a gate to Peacock Meadows at the point were Peacock Lane becomes narrower (at the last round about to Jennett’s Park) and that gate leads to the field at the end of which you’ll find the tunnel, near the power distribution tower. You can only see the tunnel when you get close to the tower as it is covered in vegetation on this side as well. At the end of the day the tunnel wasn’t so exciting after all, but as Mr Spock of Star Trek once said “After a time, you may find that having is not so pleasing a thing after all as wanting. It is not logical, but is often true“. The search for the tunnel was in itself the reward. Not surprisingly, before looking for the tunnel the tunnel we rode around Bracknell just to increase the mileage of our ride and we decided to take a shared pedestrian / bicycle path from Harvest Ride called Quelm Lane, which I had ridden on a few times before, but Richard didn’t. What I didn’t know was that along this path there is a park called Braybrooke Recreation Ground with a calming lake. The park’s football field is visible from the path at one point, but the lake isn’t. When Richard asked what else was in that park we decided to investigate and it was well worth it. After finding the tunnel we decided to head home through Jennett’s Park, but there was one last thing to show Richard. The Copse in the middle of the Peacock Meadows field in Jennett’s Park. I had been there many times before, but at different moments of the year. I was surprised by the sheer beauty of the carpet of bluebells in this small forest of the field. Not only visually appealing, but a wonderful smell as well… Truly a feast for the senses. If you have any questions, don’t hesitate to comment or send me a message through the contact form. Please subscribe to my Blog and/or to my YouTube channel if you don’t want to miss the next one and help me spread the word by liking and sharing my Facebook Page and Tweeter feed also. Thank you for your time!